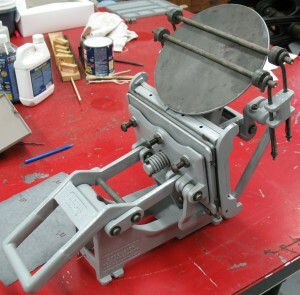 Our smallest printing press is a Kelsey Excelsior 5×8 Model U tabletop press. When we got it, the press had surface rust everywhere and paint almost gone. The rollers where melted/scorched/hardened into the cardboard box that held them. When we got it it was suffering from fire and water damage. Most of the paint was worn off, there was rust all over, and the rubber form rollers were partly melted and partly turned rock-hard. Fortunately all the parts were there. After disassembly, rust removal (using Evapo-Rust), old paint removal, repainting, reassembly, and lubrication we ended up with a nice press that works quite well. Since these photos were taken I have made a set of composition rollers for the press. It was my first attempt using composition material, and had to reconcile the various old recipes that can be found online. The material was incompletely melted so the finished rollers have hard lumps in them but still do a decent job of inking the form. All cleaned, painted, and lubricated, all that is left is to make some form rollers for it. The other problem still to be addressed is that the roller trucks have no notch to engage the dog on the core (shaft) so there is a tendency for the rollers to slide rather than rolling over the form. It would also be nice to attach the press to a nice wide base plate with rubber feet so it does not slide around in use. Perhaps I can also arrange for this base to form the bottom for a carrying case to make it easy to take the press on the road. 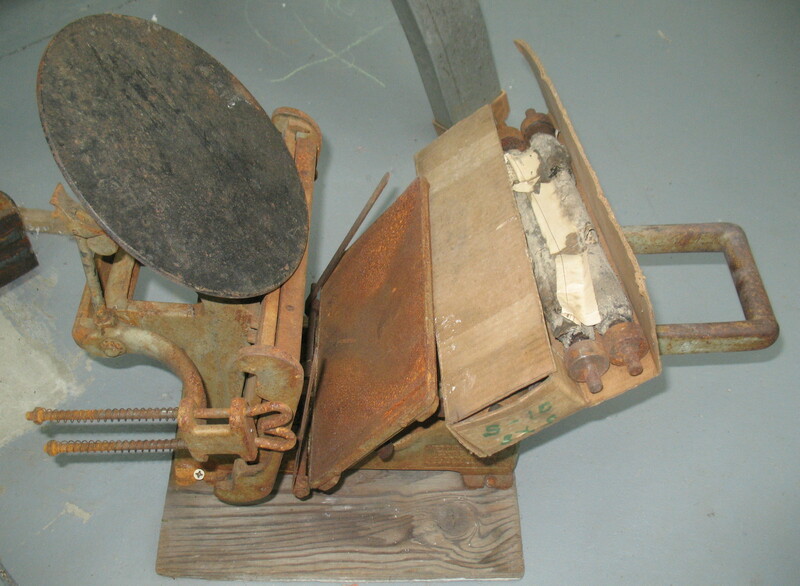 The case could also hold all the accessories required to run the press. This is no longer our smallest press!